March 1911 cover. 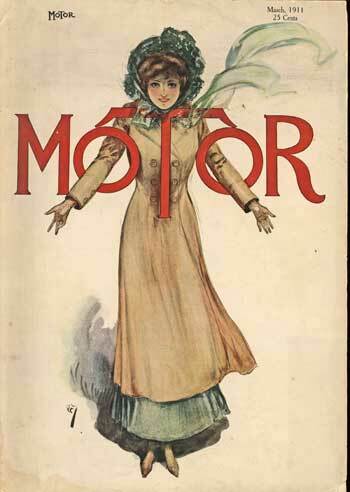 A waifish young woman dressed for winter in a tan coat and green hat and scarf extends her arms through the O's of MoToR. Jean de Paleologu (or Paleologue), who often signed his works PAL, (August 29, 1860 — November 24, 1942) was a Romanian poster artist, painter, and illustrator, active both in France and the United States. Probably best known for his art nouveau-style posters in the 1890s, he was an extremely popular and very prolific poster artist. The products advertised in his posters included aperitifs, liqueurs, champagne, cigars and cigarettes, toothpaste, soap, bath oil, roller skates, a copying machine, and many more. His commissioned work also included posters, though, for the circus and cabaret music hall, noted dancers Loie Fuller and Jane Avril, hotels and theatres, train service, sports competitions, a department store, and even the lottery. He is known to have produced hundreds of such posters, and they are splendid in color, design, flamboyance, and sensuality. Perhaps the most famous series of his posters, however, were for brands of bicycles. In most of the bicycle posters, one or more lovely, sometimes ethereal, young women were pictured alongside a bicycle. These Art Nouveau posters were extremely influential during the bicycle craze of the 1890s. PAL, though born in Bucharest, took art training in England. He then returned to Romania to continue schooling at a military academy. With that behind him, he returned to London several times and began a career as magazine illustrator, with Vanity Fair lithographs one of his most successful accounts. He was one of the leading artists for that publication, producing caricatures of prominent statesmen, authors, athletes, artists, etc. In 1893, he moved to Paris where he continued as an illustrator before moving into poster design. That same year, a small book of Russian poems he illustrated, Petits Poemes Russes, was published. (Included in a list of other PAL book illustrations are 1892's A Woman's Courage and 1900's Charles Lamb. The Life and Works. ) His illustrations were appearing in publications such as Strand Magazine, the New York Herald Tribune, Vie en Rose, and others. One of his earliest automobile-related works was a poster he designed for the 1897 Salon du Cycle et de l'Automobile, held at the Palace of Industry in Paris. At that show, amongst thousands of bicycles, were a handful of automobiles, inclusive of one electric car. Although he had moved to the U.S. in 1900, from about 1900 to 1903, PAL had done pictorial work for the first three Paris Automobile Salons. In 1905, for New York's Importers Automobile Salon, he was responsible for artistic presentation. The main features were panoramic pictures (more than twenty oil-on-canvas panels, each 20 x 10 feet) of an auto road race with a Long Island-like background. The work took a month to complete but the artist was paid well — $ 10,000 — for his efforts. He also produced a show poster known as "Winged Wonder" (a mythological woman in a filmy gown with wings on her back and feet hovering over an open car),an illustrated advertisement for the show, and an official, humorous show book: Mother Goose Rhymes for Motor Ganders. There were other lesser-known forays into automotive illustrations, too. Also in 1905, he illustrated a catalogue of Fiat cars; customers could send in for their own copy. That year he branched out into magazine illustrations related to cars, as well, with illustrations he drew of the Ormond-Daytona automobile races for Automobile Topics. For the 1908 Importers Show, PAL drew crayon sketches of attendees, to be raffled at the opening dinner. That year he also did a poster for the Vanderbilt cup race held on Long Island. Other automotive illustrations included mural exhibitions for New York's 12th National Motor Show, the show highlight being a painting of a golden sunset in southern California. Again, he drew the poster for that event. During his later years, he turned to portraits (such as the 1908 image of President Taft), billboard illustrations, film animation, and advertisements for the auto and film industries. He became an American citizen in 1923, and by 1927, had taken up residence in St. Petersburg, Florida, where the Department of Agriculture commissioned him to paint twenty-one paintings to advertise the state of Florida. He also taught plein air painting there. In 1940, he moved to Miami where he continued to teach and take portrait commissions. He was a member of the British society group, The Eccentric Club.